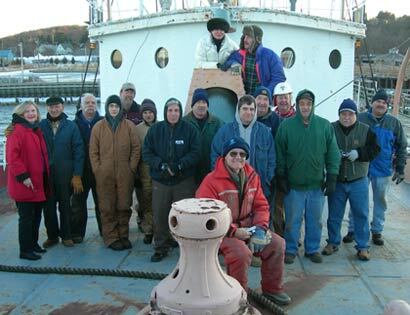 Volunteers that helped with LV-112's pre-tow projects in Oyster Bay, Long Island, NY during a bitterly cold 2010 January weekend. Many of the volunteers were from the Lightship Sailors Association, flew in from all parts of the U.S. and were former LV-112, U.S. Coast Guard crew members. Also, present, is the regular crew of local volunteers from the Oyster Bay area. 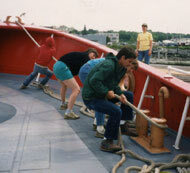 A group of students helps with securing LV-112's dock lines. 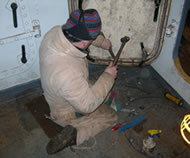 A volunteer making repairs on the watertight door seal. 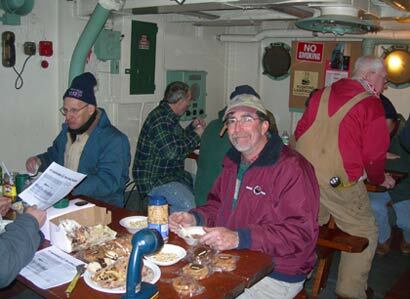 The January weekend volunteers breaking for lunch, enjoying hearty, hot, homemade soup and fish chowder with all the fixings in LV-112's heated Galley. 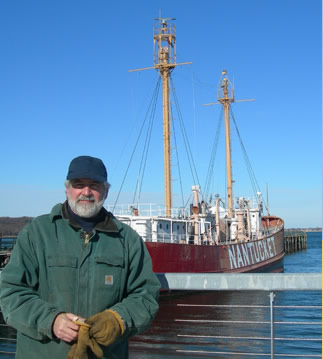 The United States Lightship Museum is composed entirely of volunteers who include former U.S. Coast Guard lightship veterans, maritime historians and enthusiasts. Moreover, we are looking for anyone who has an interest and passion for maritime history. A volunteer during January 2010, getting ready to board LV-112 and join the others to prepare the ship for its tow to its new home port of Boston.